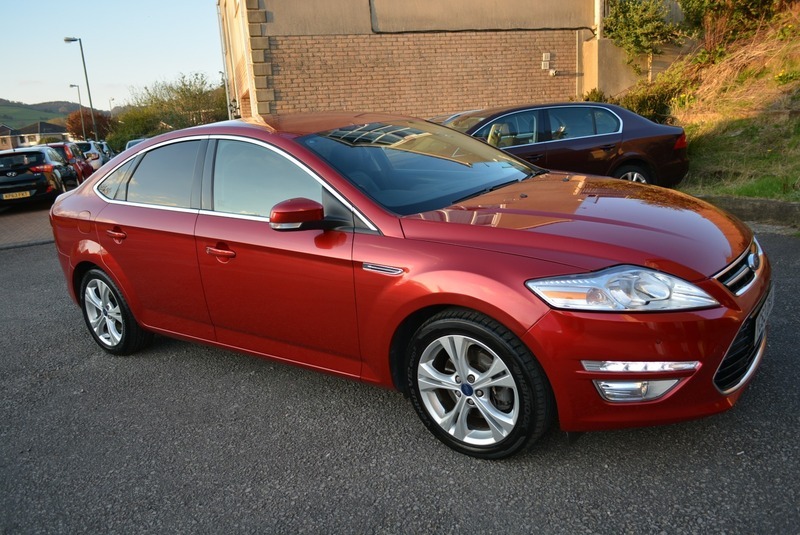 2014 FORD MONDEO TITANIUM X BUSINESS EDITION 5 DOOR HATCHBACK IN A STRIKING METALLIC RED COLOUR WITH SUPERBLY CONTRASTING FULL BLACK LEATHER WITH WHITE PIPED EDGING UPHOLSTERY. FOR THOSE LOOKING FOR A FORD MONDEO THAT HAS BEEN WELL KEPT, THEN LOOK NO FURTHER, THIS CAR IS IN FANTASTIC PRISTINE CONDITION (LOOK AT THE PHOTOS). JUST 1 PREVIOUS OWNER. IT HAS COVERED 50,993 MILES AND HAS BEEN SERVICED ON SCHEDULE WITH THE SAME SERVICE CENTRE (5 SERVICES RECORDED IN THE STAMPED SERVICE BOOK) THE LAST SERVICE WAS AT 49,833 MILES (1,160 MILES SINCE) ON THE 10-01-2019 AND AT THAT TIME WAS ISSUED WITH A NEW MOT CERTIFICATE (NO ADVISORIES). EXTREMELY ECONOMICAL TO RUN, ONLY £30 PA FOR ROAD TAX AND UP TO 72 MPG. THAT TAKES SOME BEATING FOR A CAR OF THIS QUALITY. THIS CAR, BEING THE TITANIUM X HAS VERY HIGH AND MUCH DESIRED SPEC-- JUST HAVE A LOOK AT THIS----SATELLITE NAVIGATION---REAR VIEW CAMERA---PART ELECTRIC SEATS---FULL BLACK LEATHER UPHOLSTERY WITH WHITE BEADING---AIR CONDITIONING---CLIMATE CONTROL---BLUETOOTH---RADIO/CD---PRIVACY GLASS--KEYLESS DOOR LOCKS---START/STOP SYSTEM---PRESS BUTTON START--ELECTRIC FOLDING MIRRORS--PARKING SENSORS---CRUISE CONTROL---STEERING WHEEL CONTROLS---BRAKE ASSIST---FRONT FOG LIGHTS---LED LIGHTS---DAYTIME RUNNING LIGHTS---ALLOY WHEELS---FULL SIZE SPARE WHEEL (BRAND NEW)---IMMOBILISOR---AND MUCH MORE.